There are currently no Erhu classes scheduled for 2018. 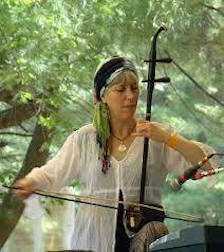 Blackstone River Theatre will offer a continuing "Intro to Erhu" (2-string Chinese folk fiddle) class with Cathy Clasper-Torch on Thursdays, Oct. 12, 19, 26 and Nov. 9, 16, 30, from 7:45-8:45 p.m. Over the years, Cathy has had many people asking about erhu lessons, but because it would necessitate the purchase of an erhu (erhu rentals are hard to come by!) we have been hesitant to offer it. However, she discovered a reliable place to purchase erhus, and would like to invite you to consider taking this class and enjoy playing a beautiful traditional Asian instrument. TO PURCHASE AN ERHU: Visit www.clarionmusic.com (They sell traditional Chinese instruments in San Francisco, CA). Phone #: 415-823-6978. Ask to speak to "Lu" (let him know you are taking an erhu class in Rhode Island!) Ask for the "better model Erhu" - these are currently on sale from normally $300 to around $180! An erhu should include: erhu/bow (attached); bridge; strings (all set-up, hopefully! ); and a case. Clarion Music is having a sale right now, as they will be moving to another space soon, so now is a good time to buy your erhu!